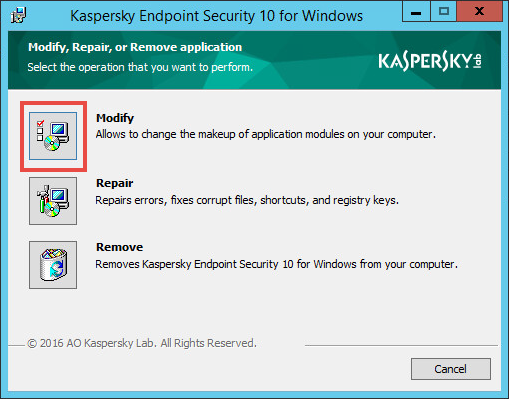 You can change application components of Kaspersky Endpoint Security 10 for Windows locally or remotely. This option is available if Kaspersky Endpoint Security 10 for Windows was installed on a computer locally. If it was installed through the Kaspersky Security Center 10 policy, then you must change the components remotely. Open Control Panel → Programs and Features or press Win+R on the keyboard and enter appwiz.cpl. Choose Kaspersky Endpoint Security 10 for Windows. Enter the login and password if the actions are password-protected according to the policy. Select the check boxes for the components you are planning to use. Clear the check boxes for the components you do not want to use. Go to Tasks. Click Create a task. 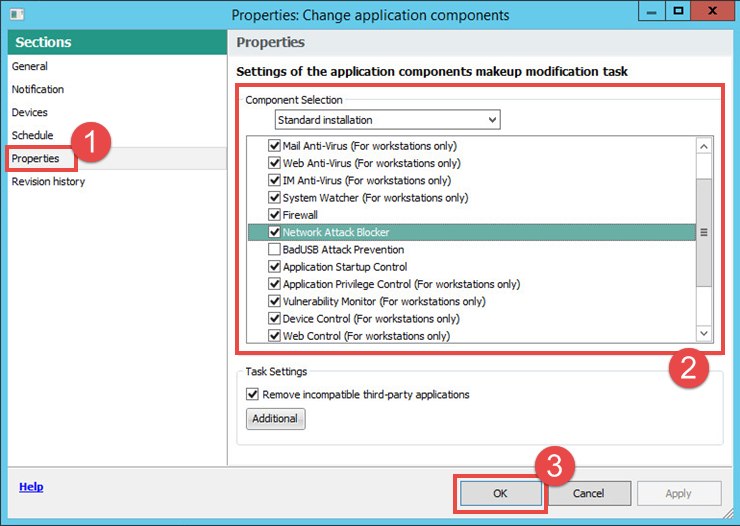 Create the Change application components task. Open the properties of the created task and go to the Properties section. You you are adding the encryption component for versions of Kaspersky Endpoint Security 10 for Windows earlier than Service Pack 2 which have no AES module, install it. Please note that different versions of Kaspersky Endpoint Security 10 for Windows are compatible with different versions of AES modules. We recommend that you install the MSI package included into the installation package you have used. The file is named aes_encryption_module.msi. 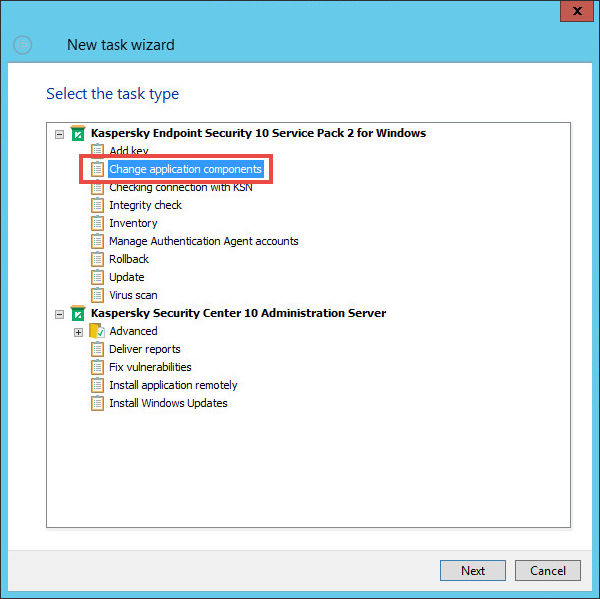 Kaspersky Endpoint Security 10 Service Pack 2 uses special drivers as its own encryption module and the encryption components are added and removed using the Change application components task.